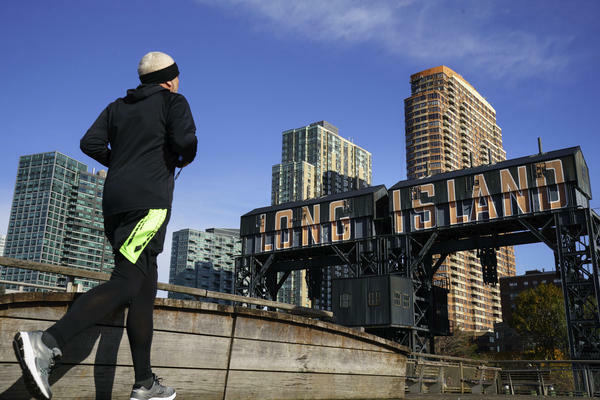 A man runs along the waterfront in the Long Island City neighborhood of the Queens borough of New York City, which had been the planned location for a secondary Amazon headquarters. It is also a big reversal of its much-hyped decision to build the campus in Queens after a highly publicized nationwide search that lasted over a year. An Amazon spokeswoman told NPR that the company plans no further negotiations with city and state officials in New York, where the firm has faced scathing criticism in recent City Council hearings. One key issue was the almost $3 billion in state and city tax incentives Amazon was slated to receive in exchange for creating some 25,000 jobs. Local union leaders had organized protests against the company and have accused it of anti-union behavior. Also, the state's Senate leader recently nominated an ardent critic of Amazon's deal to the state board that would have had control over Amazon's plan for Queens. "A number of state and local politicians have made it clear that they oppose our presence and will not work with us to build the type of relationships that are required to go forward with the project we and many others envisioned in Long Island City," Amazon said in a statement, citing a recent poll it had commissioned showing that the majority of New Yorkers supported Amazon's presence. New York City Mayor Bill de Blasio said Amazon was throwing away an opportunity by pulling out of the deal. "You have to be tough to make it in New York City," he tweeted. "We gave Amazon the opportunity to be a good neighbor and do business in the greatest city in the world. Instead of working with the community, Amazon threw away that opportunity." Amazon said it will not search for a new location for another HQ to replace New York City. This leaves the company with its main headquarters in Seattle and a second one planned for Northern Virginia. New York City will remain one of Amazon's biggest hubs, and the company says it will invest in its existing teams there. "I think this is a real lesson for everybody, whether you are on the organizing side or you're on the corporate side, about the importance of communication," said Chris Hanway, executive director of Queens-based Jacob A. Riis Neighborhood Settlement. The nonprofit is based in the Queensbridge Houses — the largest public housing complex in North America. Hanway, who had pushed Amazon officials to provide concrete promises on the hiring and training of local residents, said he had mixed emotions about the company's decision to withdraw. "I can honestly say that while I had a very open mind about this project, I did have a lot of healthy skepticism," he said. "And I think there was a part of me that felt a little bit relieved. But I also felt sad about the potential lost opportunities for the people in Queensbridge and public housing in Western Queens." The Retail, Wholesale and Department Store Union called out Amazon's actions as irresponsible. "Rather than addressing the legitimate concerns that have been raised by many New Yorkers, Amazon says you do it our way or not at all," said union spokeswoman Chelsea Connor. Amazon is one of NPR's financial supporters. Amazon's surprise decision to create two new headquarters locations followed a nationwide search, in which 238 locations had submitted bids with incentives, in hopes of wooing the company. This highly publicized competition added a layer of scrutiny on the incentive packages offered by the two winning locations, Northern Virginia and New York City. When Amazon announced its selection of the winning cities, it said part of the reason was that the Washington, D.C., and New York City areas stood the best chance of attracting the high-tech labor force needed. But Amazon appeared unprepared for the level of vocal opposition in Queens, where the company's plans were slated near the district that elected Amazon critic Rep. Alexandria Ocasio-Cortez to Congress. The deal with Amazon was largely negotiated by Mayor de Blasio and Gov. Andrew Cuomo, who famously joked about changing his name to "Amazon Cuomo" to win the second headquarters. Privately, Amazon executives pondered whether New York was a good choice from the early days of the deal, a person familiar with the deliberations had told NPR. Loud criticism mounted quickly after the deal was announced, including from Ocasio-Cortez. Many on the City Council also decried its process, which used a procedure that left the council with little power over Amazon's plan. "I think everybody miscalculated here," said Erik Gordon, a professor at the University of Michigan's Ross School of Business. Amazon "believed that they were doing New York such a big favor by bringing tech jobs and then all the ancillary jobs that they thought that the protests would not be as strong as they were," Gordon said. And, instead of working out a deal, the opposition "basically punched Amazon in the face in public," he said. NPR's Jasmine Garsd contributed to this report. Amazon is abandoning its plans for a New York City headquarters. In doing so, the company has canceled a deal that had the backing of the most powerful politicians in the state. The deal did not have the backing of some local leaders, community activists and union chiefs, and after weeks of protests, they are claiming victory today. NPR's Alina Selyukh has been following this saga. She's here in the studio now. And start with, what is Amazon saying was the final death knell for these plans? ALINA SELYUKH, BYLINE: They don't specify any specific event. What they say is essentially a number of state and local politicians have made it, quote, "clear that they oppose our presence and will not work with us to build the type of relationships that are required to go forward with this kind of project." Essentially, they're saying no more negotiating on this deal. And negotiations have been extremely intense in New York. The firm has faced scathing criticism in recent city council hearings. There have been protests outside of those hearings. And one of the key issues has been the fact that city and state tax breaks that are being offered to Amazon are almost $3 billion. In exchange, Amazon was planning to bring up to 25,000 jobs, but the amount of the incentive package has really upset some leaders. And one academic actually I spoke with cleverly described this in a way that I think summarizes it, that Amazon essentially thought it had the upper hand and it could bully New York City into getting what it wants, while New York City wanted Amazon but instead publicly punched it in the face over and over with critical statements. So what is the reaction to today's news from these community leaders and union chiefs and all the rest who were pushing for this? Are they having a big old victory party? SELYUKH: They are indeed. There is one scheduled for this afternoon, for this evening. And the groups include housing affordability groups, unions who have been pointing out the reputation that Amazon has as anti-union. Some of the criticism has come from Representative Alexandria Ocasio-Cortez, who got elected from an area that is close to where Amazon was going to build the headquarters. And the final thing too that happened was that the state Senate leader recently nominated an ardent critic of Amazon's deal to the state board that had control over this deal in the plan for Queens. And I think all of this became too much for Amazon. KELLY: I'm guessing we're hearing a different reaction from the politicians who were on board and helped negotiate this deal - Governor Andrew Cuomo and the mayor of New York, Bill de Blasio. SELYUKH: It's actually really interesting. De Blasio today is pushing back against Amazon. He tweeted, you have to be tough to make it in New York City. We gave Amazon the opportunity to be a good neighbor, and they essentially are walking away from this opportunity. Cuomo, for his part, has been saying for quite some time that all of this opposition has been political. He points to several polls that have shown support in New York for Amazon's presence, even if not for specific details of it. But he is saying essentially politicians locally will have to answer to voters about, you know, how they walked away from potential 25,000 jobs. KELLY: And what is Amazon's next move? Are they relaunching the hunt for another headquarters? SELYUKH: They are not. They said they are done searching for HQ2s. They spent more than a year looking for locations when they settled on New York City and Northern Virginia. And Northern Virginia will get the second HQ, and New York already has a really big presence of Amazon. It's already the second-largest presence outside Seattle and they will continue growing it there. We should point out Amazon is one of NPR's sponsors. But I think, walking out of this big deal, there will be a lot of conversations about how much cities should pay for deals, when it's time to walk away. And this will go down in history as probably one of the most bizarre and hugely public corporate expansions that did not end up happening. KELLY: It's been a lot of work for you, and I'm sure you are relieved to close this one chapter on it. NPR's Alina Selyukh, thanks so much.